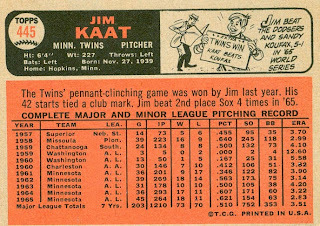 Jim Kaat pitched for 25 seasons (1959-83), as a starting pitcher through the 1978 season, before converting to a reliever. His first 15 seasons were with the Minnesota Twins and their predecessor, the original Washington Senators. He was the last active player from the “old” Senators. Kaat was signed by the Washington Senators in 1957, and pitched in the minors for the next 4 seasons. Jim also played for the Senators in 1959 (3 games) and 1960 (13 games). 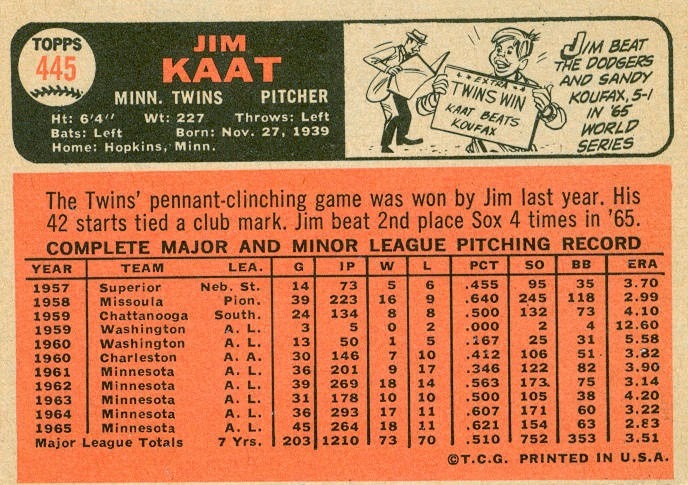 When the team moved to Minnesota in 1961, Kaat became a full-time major-leaguer. He struggled at first, leading the AL in hit batters and wild pitches in his first 2 seasons. Kaat hit his stride in 1962, winning in double figures for the next 15 seasons. He was also a great-fielding pitcher, winning 16 consecutive Gold Glove awards (1962-77). 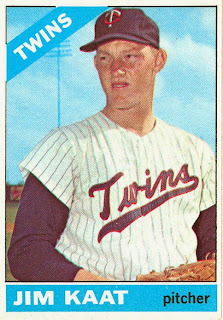 In the early-to-mid 1960s, Kaat was part of a formidable starting rotation that included Camilo Pascual, Jim Perry, and Jim Grant. By 1967, Pascual was out, replaced by Dean Chance. 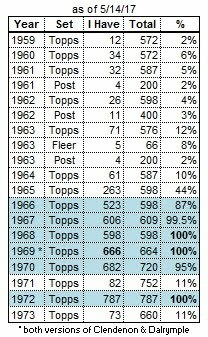 The Twins were competive every season from 1962-67 (except for a slump in 1964). They won the AL Pennant in 1965, with Kaat tallying 18 wins (along with Grant’s 21). In 1966 Kaat led the AL with 25 wins (his only 20-win season with the Twins). As a Phillies fan, I thought this trade was great. From 1972 to 1976, the Phillies methodically replaced “pitchers” Billy Champion, Lowell Palmer, Barry Lersch, Billy Wilson, and Ken Reynolds with Steve Carlton (’72), Jim Lonborg (’73), Ken Brett (’73), Tug McGraw (’75), Jim Kaat (’76), and Ron Reed (’76)! Kaat was a starter for the Philles from 1976-78. In 1979 he was replaced by ex-Met Nino Espinosa, and was sold to the Yankees in May. From mid-May 1979 to late-April 1980, Jim appeared in 44 games (1 start) for the Yankees. Kaat was purchased by the Cardinals on April 30, 1980, and played with St. Louis until getting his release in July 1983. He was a starter and reliever in ’80, but pitched mostly out of the ‘pen in his last 3 seasons. 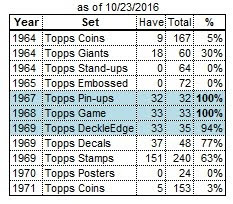 Kaat LEGITIMATELY played in 4 decades, unlike those gimmicky frauds Tim McCarver and Minnie Minoso. After retirement, Kaat was the Reds’ pitching coach from 1984-85, then broadcast Yankees and Twins games for 22 seasons. Since 2009, he has broadcast games for the MLB Network. 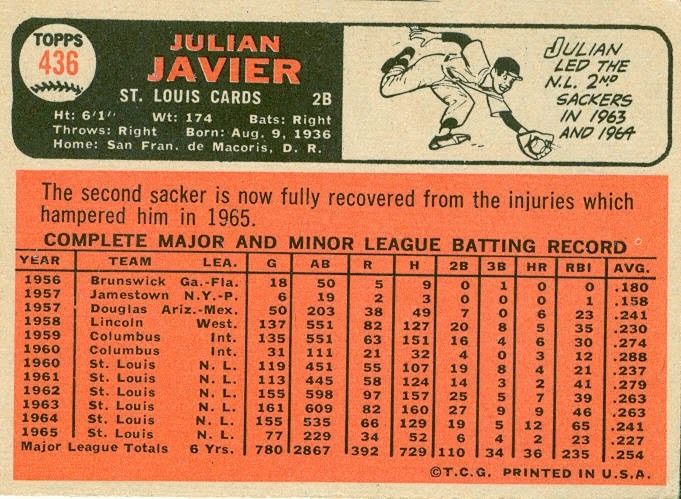 When my brother and I started collecting cards in May 1967, Julian Javier was one of the few names we got wrong. As it turns out, he didn’t use the English pronunciation for his first name, nor did he pronounce his last name JAY-vee-er. 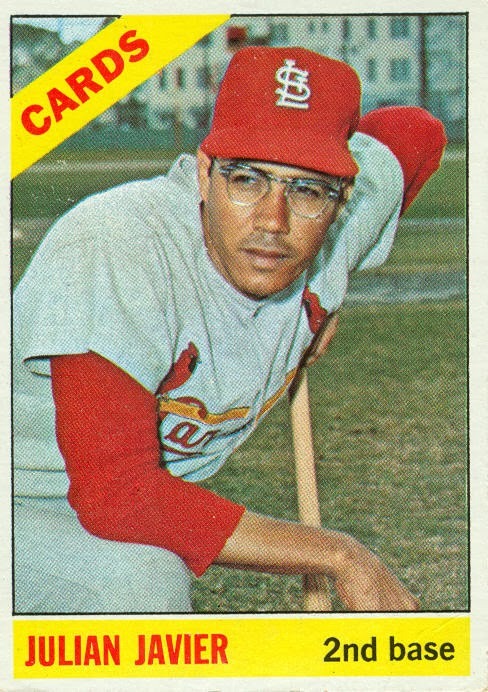 Julian Javier was the 2nd baseman for the Cardinals throughout the 1960s, including the ’64, ’67, and ’68 World Series. 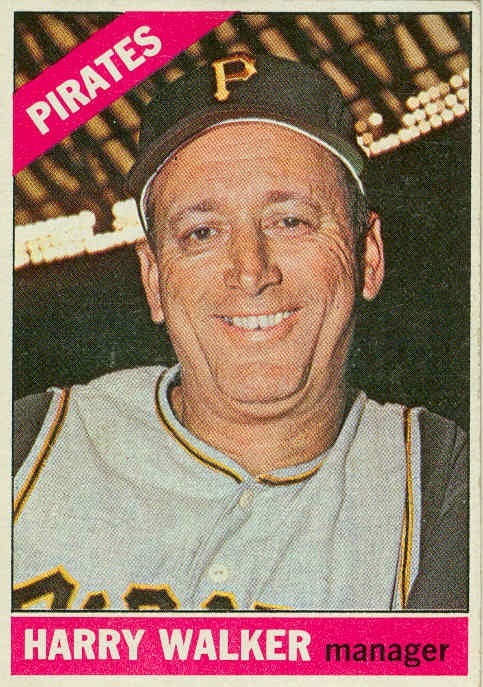 Javier was signed by the Pirates in 1956, and played in the minors until his May 28, 1960 trade to the Cardinals for pitcher Vinegar Bend Mizell. 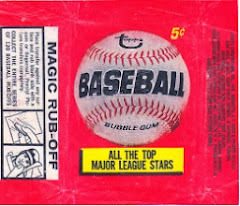 He was thrust into the starting lineup that day, and started the remaining 119 games at 2nd base in his rookie season. 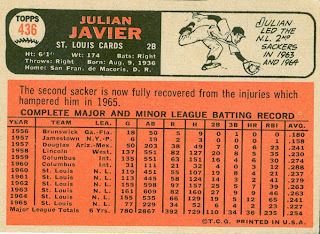 Except for missing 65 consecutive games from mid-June to late-August in 1965, Javier had a hammerlock on the Cardinals’ 2nd base job from May 1960 until mid-June 1971, when Ted Sizemore took over the position. He never won any gold gloves, but he was an all-star in 1963 and 1968, and hit a career-high 14 homers in 1967. After the 1971 season, Julian was traded to the Reds for pitcher Tony Cloninger. He started 17 games that season as the Reds’ backup 3rd baseman (behind Denis Menke), and had several dozen pinch-hit appearances. Javier was released after the season, ending his 13-year career. His son Stan (named for teammate Stan Musial) was an outfielder for 8 teams from 1984-2001, most notably with the Athletics and Giants. 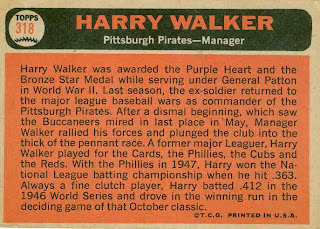 Harry “The Hat” Walker managed the Pirates from the start of the 1965 season until midway through the 1967 season. He then managed the Astros from the 2nd half of 1968 until mid-August 1972, when he was replaced by Leo Durocher. Walker’s baseball career began in 1937, when he was signed by the Phillies. After 3 seasons as an outfielder in their farm system, he was traded to the Cardinals, and played 2 seasons in their system, including a few games each year with the big club. Harry played the entire ’42 and ’43 seasons with the Cardinals, as a reserve in 1942, and as the everyday center fielder in 1943. He made the all-star team in ’43, and played in the World Series both years against the Yankees. Walker missed the 1944 and 1945 seasons while in military service, then returned to the Cardinals in 1946, where he hit .412 in the World Series vs. the Red Sox. 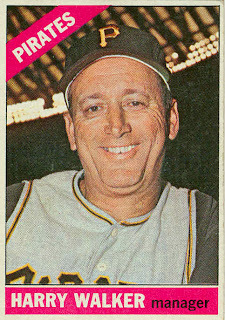 Harry was traded to the Phillies in May 1947, and went on to win the NL batting title with a .363 average that season. He also chipped-in a league-leading 16 triples. Walker began the ’48 season in center field, but lost the job to rookie Richie Ashburn in early May. He spent the remainder of that season as the backup CF/LF, and pinch-hitting. He also caught 4 straight games in late-August, including both ends of a doubleheader. He was traded to the Cubs after the 1948 season, then quickly bounced to the Reds and Cardinals. After a 4-year gap, Harry returned as the Cardinals’ AAA manager for ’63 and ’64, then moved on to his 2 big-league managing gigs from 1965-72 as mentioned above. Walker passed away in August 1999 at age 82. 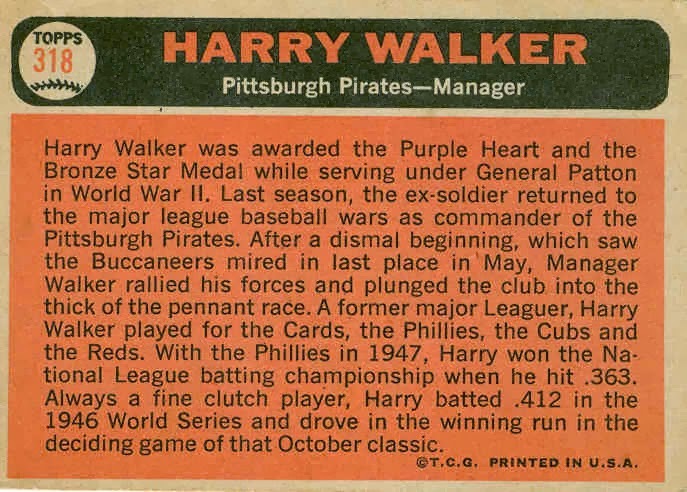 Harry’s brother Dixie Walker was a starting outfielder for the Brooklyn Dodgers in the 1940s, and played for other teams during the 1930s.